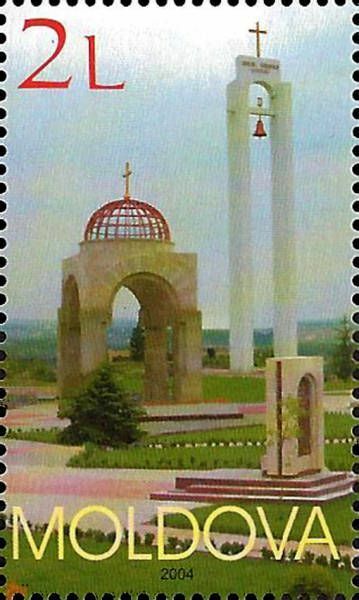 On 22 August 2004, the Post Office of Moldova (Poșta Moldovei) issued a postage stamp with the title 60th Anniversary of the Jassy-Kishinev (Iaşi-Chişinău) Offensive During The Second World War. The issue comprises one stamp on a souvenir sheet, with an associated cancellation (postmark) and first day cover (FDC). The designer was Ivan Picev. The printing was performed by Tipografia Centrală, Chişinău. The Jassy–Kishinev Operation, named after the two major cities, Iaşi and Chişinău, in the staging area, was a Soviet offensive against Axis forces, which took place in Eastern Romania from 20–29 August 1944. The 2nd and 3rd Ukrainian Fronts of the Red Army engaged Army Group South Ukraine, which consisted of combined German and Romanian formations, in an operation to reclaim the Moldavian SSR and destroy the Axis forces in the region, opening a way into Romania and the Balkans. The offensive resulted in the encirclement and destruction of defending German forces, allowing the Soviet Army to resume its strategic advance further into Eastern Europe. It also forced Romania to switch allegiance from the Axis powers to the Allies. Read more.. This article uses material from the Wikipedia article 'Jassy%E2%80%93Kishinev_Offensive', which is released under the Creative Commons Attribution-Share-Alike License 3.0.